What is all this talk about keywords? 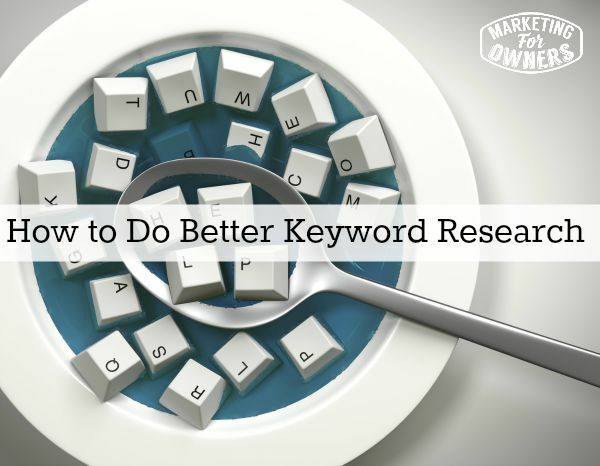 Keywords have to do with what your customers want to know. Now, let me explain why you need to know that. In our system, you have a website that teaches, that is working and effective, and is teaching your customers something. You have your social media profiles filled in, and you know who your typical perfect customer is. Once you know this, then you need to know what to write about. Your customers are going to look to you as an expert in what they are wanting to know. You are going to provide them with the answers and information that they need. You need to get inside their head to find out what you need to know so that you can provide those answers. Now those answers need to be relevant, and based on what your customers think and what Google thinks. Google ranks things by your keyword search. Google then brings up the results best related to that keyword. But in general, keyword research is done in the Google keyword planner. Not only does that mean that everybody else is looking for keywords, but they also might have entered the same keyword search. For instance — in my Fire Safety business, I might enter they keyword “fire extinguisher” and of course everyone else has used this same keyword search and has a list and have written about that subject. But the other thing is that Google can then only bring out things directly related to fire extinguishers. So if there are slight nuances, a customer calls it something else, but how would Google know? There are other ways of finding out. A better example of that is if I enter in the keyword “megaphone” it will not bring up the fact that some people will call that product a bullhorn. It’s the same product, just different names — Google is unlikely to know. If I say that my customer is looking for a megaphone or a bullhorn it is not going to come up. I need to find out what they are looking for. So here is a list of totally free ways of doing this. 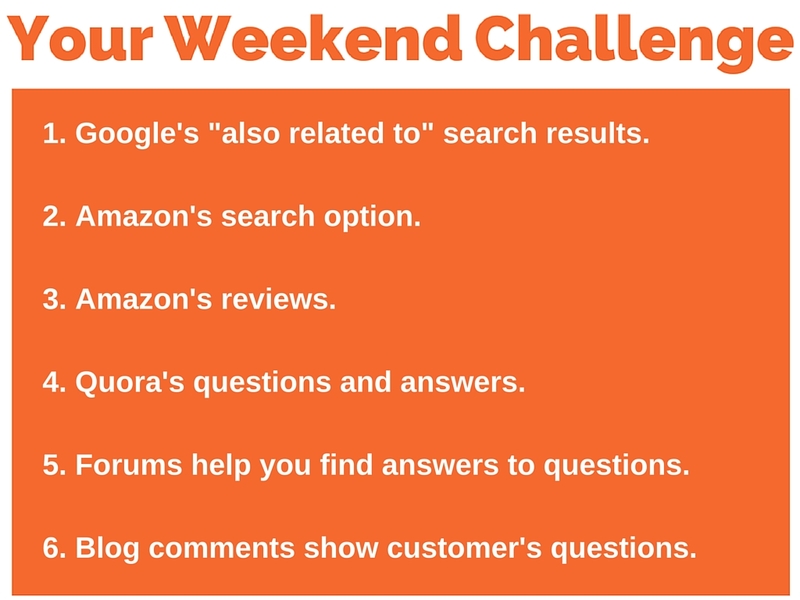 And yes — this is your weekend challenge. When you are searching Google, not at the top, but somewhere at the bottom, Google puts up “also related to” results. These are a bunch of other results, so what Google is telling you is that these other results are somewhat related to your keyword that you searched. You should be talking about those other terms as well. You may have to write about them, you may have to inform your customers about them, there may be questions that need to be answered, or they just may need to be brought up in your main article. This can include articles you have written, tweets, in titles of your pins on Pinterest, in Facebook posts, and all of these kinds of things. Keywords are relevant to everything. Instead of talking about what you want to talk about, you need to talk about what your potential client wants to know about. Quick Tip — If you go to the free tool keyword.io and put in a term, it actually brings up all the results that would come up at the bottom of Google. It also does it for Yahoo and Bing. It does it all within the tool and saves you a lot of writing. Amazon has products and books galore. When people come in and search the Amazon tool bar at the top, Amazon brings up related searches to the things that it thinks are relevant to what you searched for. For instance, if you were looking for an acne treatment, or looking for a book on how to get rid of acne, people will search in all sorts of ways, but Amazon has its own search engine and will track what you are searching for and bring up relevant items based on what you searched. Make a note of those because those are the things that people are generally searching for. The chances are that there will be a book about whatever it is you are selling. There will also be products related or the direct product that you are selling, and there will be reviews from genuine users. Some of these are extensive and very thorough and very well written. If you read those reviews, you will see the way people outside talk about your product. You will get a lot more insight from inside their minds of what was important, and what wasn’t important to them, as well as what they liked and what they are looking for. A lot of people put the pros and cons, so look at their pros that they have listed. Theirs might be different from yours and might be something you hadn’t even thought about. Quora questions is a lot like Yahoo answers. 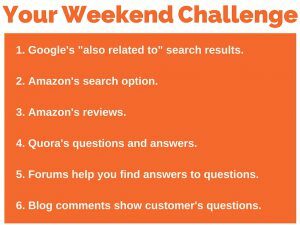 Lots of questions have been asked and answered into Quora over the years and people have taken the time to answer them. Go into Quora and search for your product or service, and then put a question in that you think might get asked about your products. Once you do that, you can see the history of answers and other relevant related questions that others have asked that sound similar. On Quora, there are a lot of ridiculous questions — so don’t let that throw you. There are also a lot of genuine serious questions on there as well. You will be amazed at what people want to know. Famous people in the Internet Marketing World get in there every day answering questions. There are forums for everything. I drive an Audi, and recently I had to have a part repaired on my car. The repair garage quoted 150 pounds and it was something really simple. That is $250 American dollars and I thought, you have to be kidding me. I began to wonder if others had previously had this problem. So I Googled my car issue and found that the whole front page was forums of Audi users that had also had the same problem. I never even knew! There are hundreds of forums out there and there were loads of people explaining what the problem was and there were also tons of people looking for the answer. They explained what the answer was, what the problem was, which parts to use, how much they cost, where to get them, there were pictures how to put them in and everything. There was a lot of information there, but I could see how different people were trying to get the same answer. They asked slightly different questions, all wanting to know the same thing I wanted to know. Use these forums to get inside your customer’s head. There are blogs that relate to what you sell. You can go to places like Technorati or any blog directory and look for blogs that are related to your product. There will be a ton of information here, but what you are looking for here is not the person telling all the information, but you are looking for what the real users think. You want to see their comments. Read how they talk about things, what they ask, how they answer, the words and language they use, and the questions that they ask. This will all help your content. If you are telling people what you want them to hear, it’s not really going to work. You need to be telling people what they want to hear. You cannot get much better than that. If you have any questions about any of this stuff, just shoot me an email at info@marketingforowners.com. I read all the emails that come in and I answer as many as I can. Have a fabulous weekend and I will see you next week. Where can you search for your products keywords?